A team of researchers from the Biomedical Research Center in Baton Rouge (Louisiana) conducted a 8-week study on 152 overweight test participants, both male and female. The participants were divided into groups with different nutrition plans while their weight and cholesterol levels were monitored. Group 1 was allowed to have anything they desired for breakfast, while group 2 had two eggs for breakfast and group 3 enjoyed breakfast bagels to start their day. The egg-eating individuals lost 65% more weight and 35% more belly fat than the bagel-eaters. At the same time, no negative effects on the cholesterol levels of group 2 were found. The reason: If we consume lots of cholesterol with our food, the body reduces its own (endogenous) cholesterol production. The egg and chicken- err, the egg and cholesterol topic is often discussed and pretty controversial. Can we enjoy eggs without remorse or not? How many eggs per week are healthy for an athlete? It’s hard to come up with a number when it comes to the weekly egg consumption. According to the expert, this mainly depends on everyone’s individual tolerance. However, for overweight people or those struggling with high cholesterol levels, one egg per day is a good rule of thumb. Athletes or healthy individuals can even have up to 3 or 4 eggs for breakfast every now and then, provided they like and tolerate eggs. In a nutshell: There isn’t just one universal solution for everyone. What makes eggs so special for athletes? Eggs boast a great bioavailability of all nutrients, with the highest content of essential amino acids, for instance. What makes them special is their content of nutrients like folic acid, Vitamin A, Vitamin D, B Vitamins and secondary plant products. Are eggs a suitable workout snack? Eggs – whether it’s sunny side up, soft-boiled or scrambled – are a great pre-workout snack when consumed one hour before your training. Hands off hard-boiled eggs, though! They’re too hard on your stomach and digestion. Within one hour post-workout, eggs support muscle growth and the recovery of your muscle fibers. Eggs contain few calories (approx. 70 – 80 cal per egg) and their high nutrient density is pretty impressive. Eggs are ideal to provide your body with all essential amino acids and vital nutrients, great to boost fat burning – and still a low-calorie snack. How should I eat my eggs for the best possible protein absorption? Eggs are pretty versatile. Besides staples like egg-fried rice, pasta with carbonara sauce, or scrambled eggs, you can use them also in sweet recipes, like vanilla sauce, pancakes, baked rice puddings, etc. Sweet treats are easily turned into a power food for your body. Just make sure you cut back on sugar and fat when preparing them. 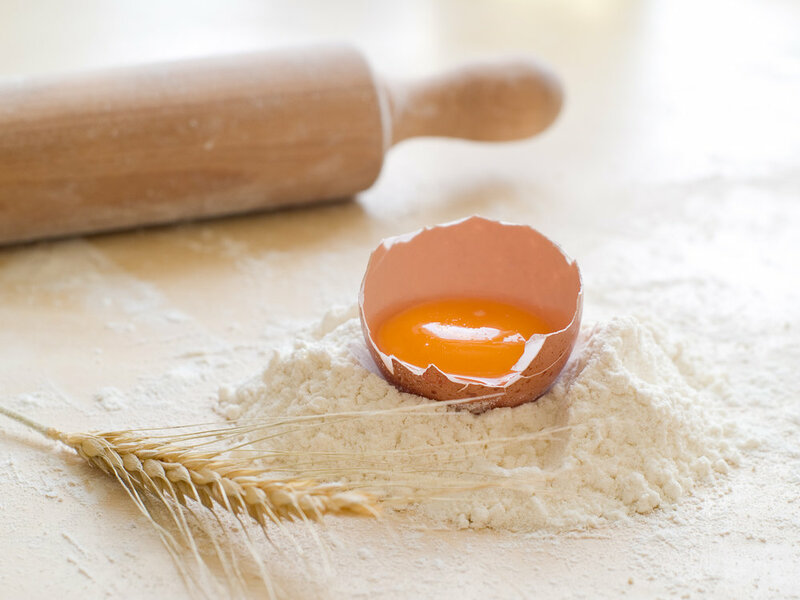 You can increase the biological value of an egg dish by combining the right ingredients, like wheat + eggs, milk + eggs or potatoes + eggs. Combining eggs and oats enhances the availability of iron. Can I eat raw eggs? For safety reasons and due to possible salmonellae infections, the consumption of raw eggs is not recommended. Does the quality of eggs matter? Should I buy free-range or organic eggs? Free-range doesn’t mean species-appropriate farming. Therefore, it’s better to buy organic eggs for ethical reasons. i like this one, and am happy to eat eggs most mornings!